Cheap Thrill is a microgame found in WarioWare: Touched! in the Total Drag stage. It reappears in WarioWare Gold, where it is one of Kat and Ana's microgames. The objective is to put the clothing (shown on the Top Screen) into the shopping cart. 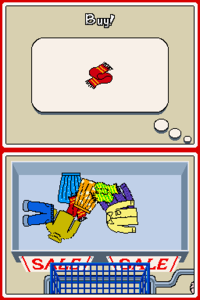 This microgame has more time to complete, as sometimes the chosen one is hidden under other clothes. 1st level difficulty: The clothing is easy to find. 2nd level difficulty: The clothing is hidden. In WarioWare Gold, two articles of clothing are required, but are still easy to find. 3rd level difficulty: There are two articles of clothing, and both are hidden. This page was last edited on February 18, 2019, at 16:31.